If you are searching for the perfect push present ideas, read on! There are many reasons that women love necklaces with pendants. The first and foremost being that it is often the first thing that people notice. It is a highly visible piece of jewelry, one that adds flare but not necessarily function, to any outfit. If your girl is like most, she will want the world to ask her what the pendant means and where she got it. Especially if it has to do with the birth of her beautiful baby. Rise to the occasion and consider one of these beautiful options. 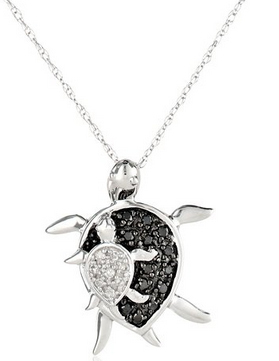 Why she’ll love it: Who doesn’t love a little turtle baby? The contrast of white and black diamonds is a true show-stopper and is sure to get noticed. These diamonds are not conflict diamonds either, so the new mother in your life can wear this pendant guilt-free.